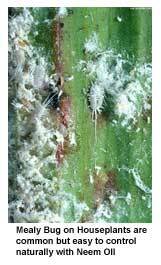 House plants pests is a part of growing plants… everyone deals with the problem differently. I like to use Neem oil to handle the problem. Neem insecticide is a safe, natural solution! Indoors, few choices exist for homeowners. Neem A Safe, Natural Option! Neem oil comes from the pressed seed of the neem tree – Azadiracta indica Juss – to be exact. It’s been used for medicinal purposes and pest control for thousands of years. It’s used as an: antispectic, antiviral, anti-inflammatory, antiulcer, antifungal. Neem products are consumed by humans and used in medication. If fact, there are no EPA restrictions in place for neem oil. Growers using neem oil in their “pest control” program like the safety and the control this natural solution provides. Nurseries are finding neem oil is effective as a insecticide, miticide and fungicide. Schultz now has 3-1 Garden Safe product made from the oil… I picked up a bottle at Home Depot. Insects prefer to die… than feed on plants treated with neem. It has shown success in fighting plant fungus and also root rot. When I spray plant I completely spray the plant and potting media. Neem looks like a SAFE, NATURAL solution for homeowners with any type of houseplant pest problems. Give it a try! I have heard that Ladybugs can be good for my garden and can be useful in warding off pests. Is there a natural way to attract ladybugs to my garden or should I focus on other methods?